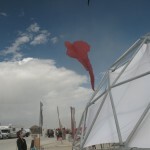 My 2010 Burning Man experience started with a full-fledged white-out of blowing dust and sand. Entering the Black Rock City with the Department of Tethered Aviation’s (DOTA) set-up crew (about 15 people) we arrived a full four days before the official start of the event. With blowing dust everywhere, and many of our own camp-mates stopped at the gate because of the white-out, my faithful companion Tonto (no wait, another story) Blake Pelton and I followed friends to the DOTA campsite. I should explain how we came to be here. 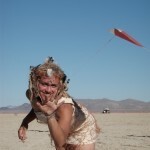 For years, really, kite friends have been relentlessly asking if I would come to Burning Man. My friends know that I’m not a camper, and I have come to the point in my life where I choose my kite-flying trips wisely. And while it might not be my “scene”, I did realize that this organization is the largest arts-granting organization in California – if nothing else I knew there would be some amazing art to be seen in Black Rock City. 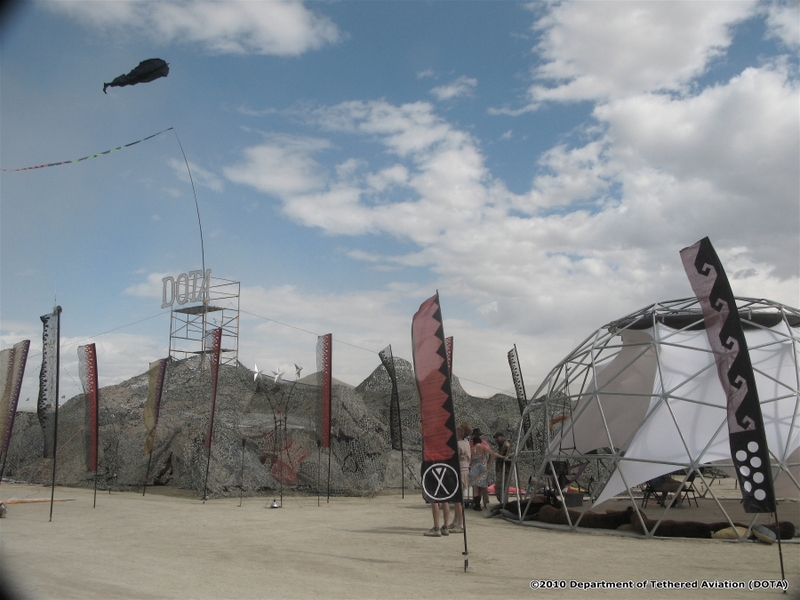 So, when fellow Colorado-Springsian Blake Pelton offered to drive (1) and possibly come home early (2), the scales tipped and I made the call to my DOTA friends Jose Sainz and Dean Jordan to say that I would join them in Black Rock City. Maybe you know that Jose is a world- renowned kite maker and Dean has been known to camp behind a sewing machine and produce large expanses of flying ripstop as well. Since Dean had claimed ownership of my sponsor-duties, Jose and I made sure that he was the last to know about my coming, and we even arranged that fellow kite maker Ron Gibian would be the one to let Dean know that I’d be there. 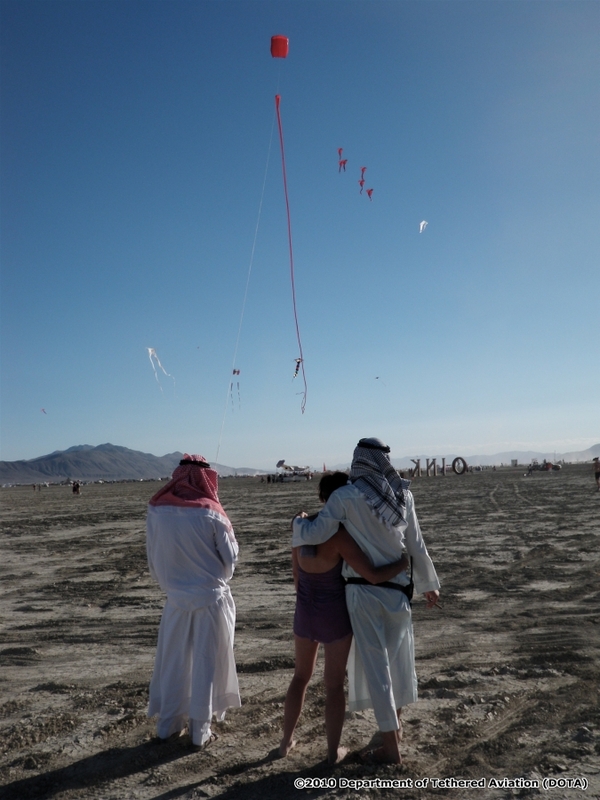 I should also mention here that I wanted to see the impact that kites have on this extremely diverse and artistic Burning Man audience. 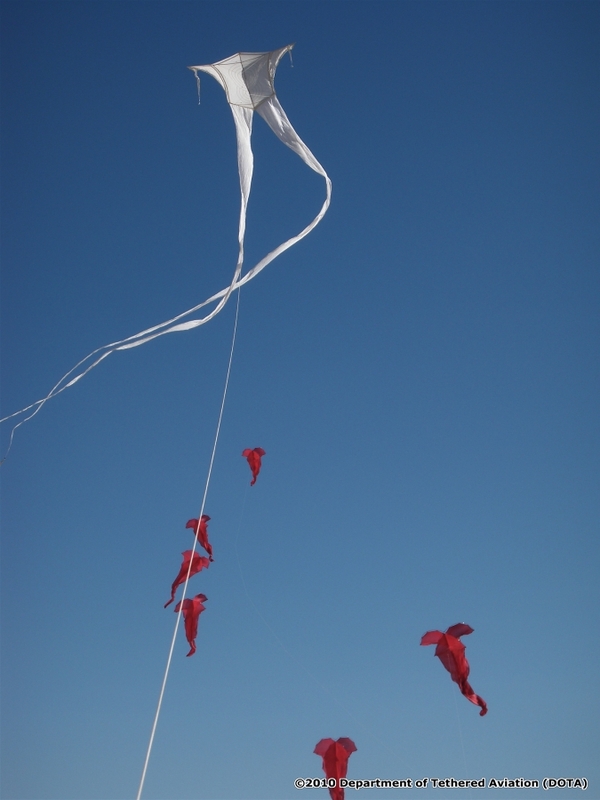 The Drachen Foundation prides itself on taking kites to audiences that have never had a kite experience. Here was another audience for me to try that approach. Since I’ve started the trend of name-dropping (see above), and plan on continuing (see below), here’s a name from mainstream kiting that newcomers might not know; Ty Billings. The Department of Tethered Aviation is the brainchild of Ty. Ty made amazing kites in the 1980s and early 1990s that featured tie-dyed fabrics used in imaginative ways. 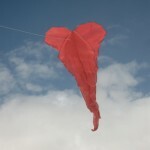 He created unforgettable kite imagery that was sometimes subtle (his rokkakus) and often outrageous (his VW bus). Other early visitors and members of the DOTA camp included Corey Jenson (the buggy meister) and Marc Ricketts (Mr. tensegrity). As my stay with the DOTA camp progressed I was very impressed with how the core group has changed, morphed, or evolved. 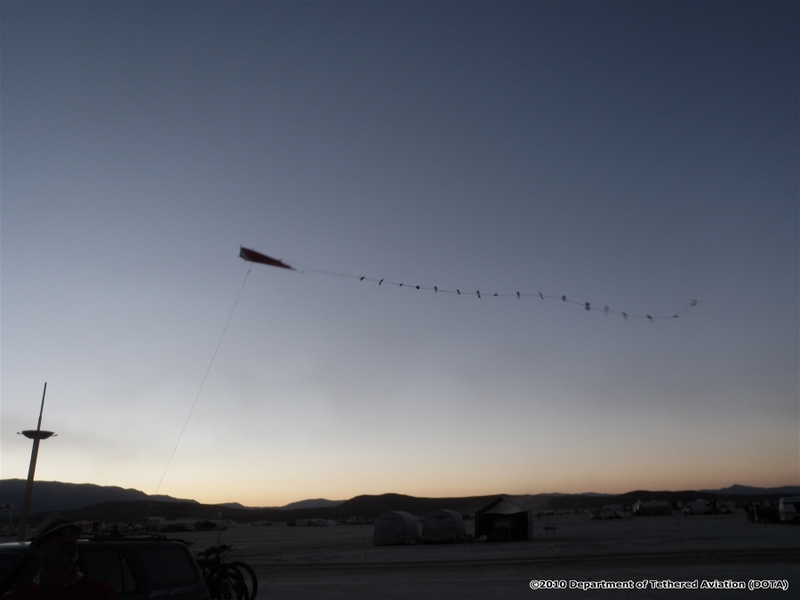 The camp is not made up of only kiteflyers – others have brought important elements to the camp and have become important role-players or sources of knowledge. By the time the camp was fully set up, we had power, plumbing (well, at least a shower), shade, and a camp kitchen that would all keep us from the harsh elements of the Black Rock Desert. In saying this, I should mention that after two days of dust storms, we then had two days of significant rain. Tent floors didn’t fare too well, and I noticed that there was no maid service, but all in all, life at DOTA was good. Anyone who has spent time in the deserts of the American Southwest knows that there is almost never steady wind. Because of the large expanses of light-colored playa, warming and cooling is constantly happening between the playa and the mountains around it. Dust devils, thermals, first-gust phenomenon from distant thunderstorms, these can all be found in a single day on the desert. 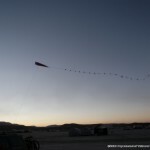 You could bet, therefore, that if steady winds kicked in, the DOTA camp would be deserted and all its members would be found flying kites in the huge expanse of area in the middle of Black Rock City. For two consecutive days, the wind became magical at about 5pm. Jose, Dean, Blake and I were joined in the air by Tim Elverston and Ruth Whiting, flying a wonderful train of what I’ll always call Russian Man-lifters (only because Tim’s imaginative design is configured almost exactly like a Russian man lifting kite from the turn of the last century (I’ve got to get home and find pictures to send to Tim). 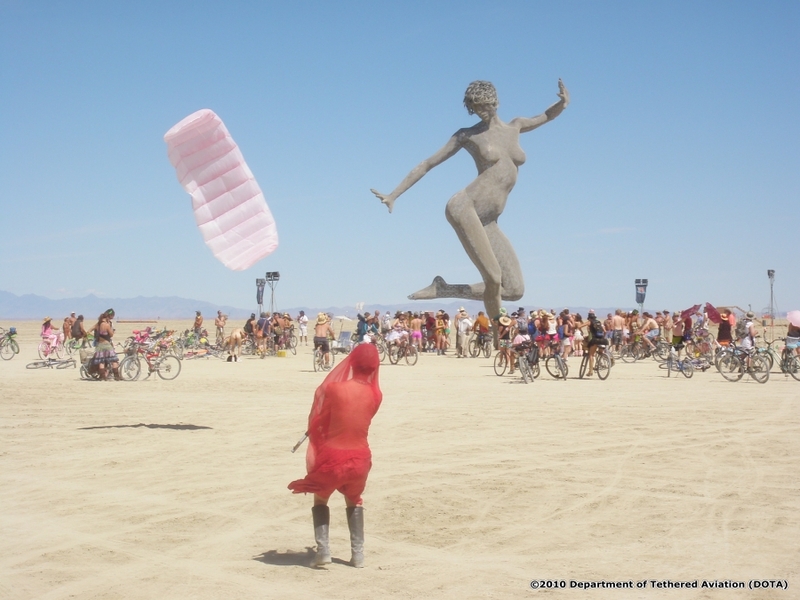 Here was the time when DOTA camp really had an impact on the Burning Man scene. People from all over the city were drawn to the group. I met friends of George Peters (kiteflyer extraordinaire) from Boulder, CO. A wonderful man introduced himself – he was Margaret Gregor’s son-in-law! Everyone flying told him the impact that Margaret has had on kite making, kite workshops, and kites in the classroom. With the number of serious artists in the Burning Man audience, I have no doubt that the DOTA influence may be profound. Here is an audience with amazing skills, unafraid to do large-scale projects, which may well include the next great kite maker. 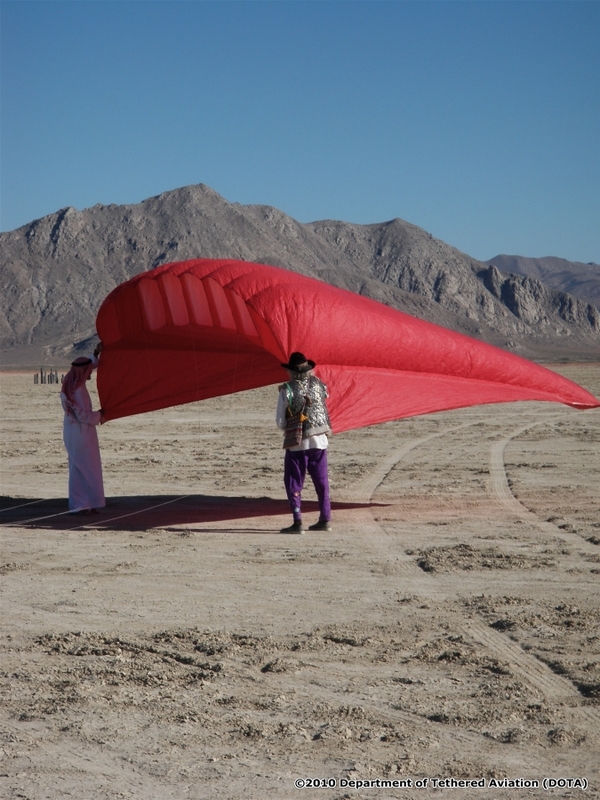 I should also mention the sighting of two really influential figures from American kiting’s recent past. The first, Daniel Prentice, was the editor of American Kite magazine, sponsor of sport-kiting’s World Cup, and owner of the Shanti Kite Line Company. Daniel is not in the middle of the kite industry as he once was, but he is a long-time Burning Man devotee and made a point to visit kite friends at DOTA. The other is Bill Osche, former owner of Ocean City Maryland’s Kite Loft. Bill was one of the primary sponsors and promoters of early East Coast kite festivals. World Record attempts were made on the beach in front of the store, wonderful events staged there, and innumerable bits of kite lore created. It was a treat to catch up with Bill and his wife, Mary, who I hadn’t seen in several years. Well, it would be improper for me to call myself a “burner” – Blake and I left late in the week because I’m currently on an around-the-world trip that includes stops in Dieppe, France, and Singapore. Selfishly, I took four full days at home before the trip over the sights and sounds of “the burn”. 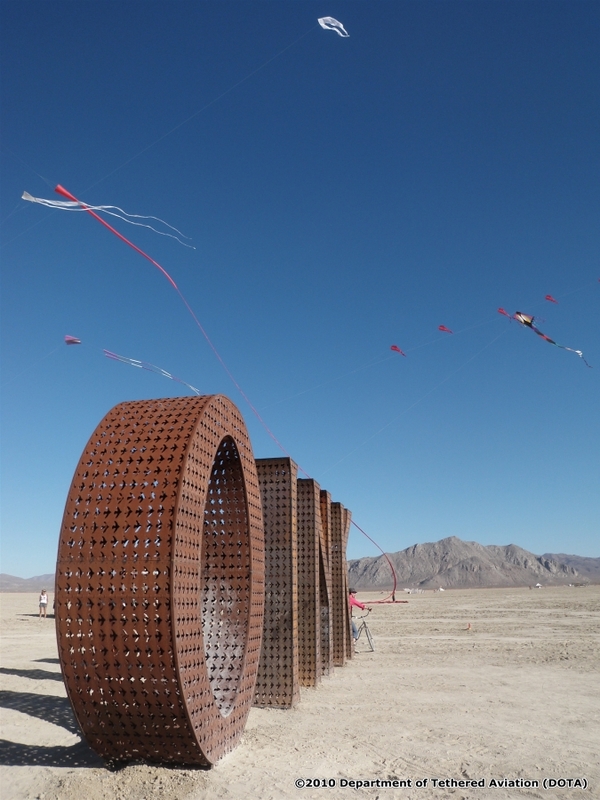 The good news is that now I have even more of a reason to go back, experience the whole week, and see again the impact of the Department of Tethered Aviation on Black Rock City. Call me a “duster”, or a “mudder”, I’ll earn the “burner” tag on my next trip. 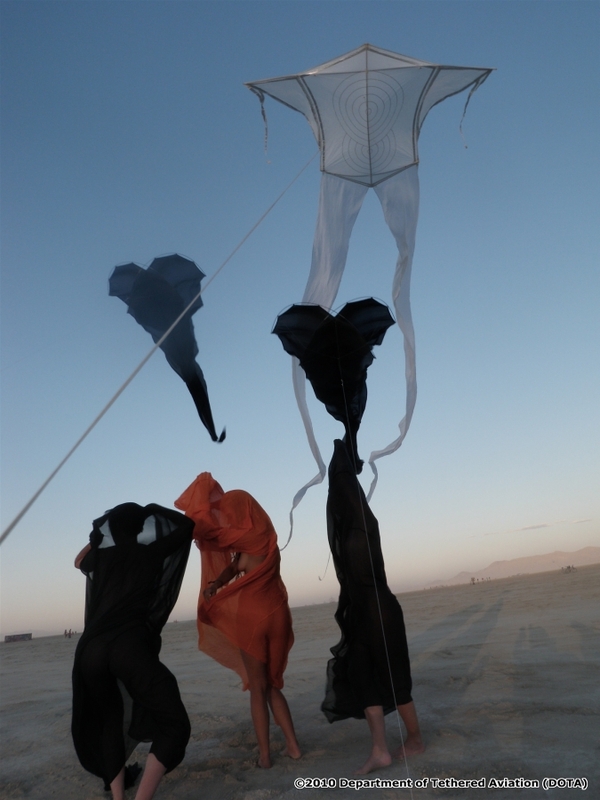 Unti then, I’ll leave you with the following, second report from Burning Man, in the words of Tim Elverston of Windfire Designs. This year marked my sixth year at Burning Man. Without going into the depths of what the dynamic world of Burning Man has given me personally, I can say that this temporary city in the desert is like no other place on earth. Our home there is D.O.T.A. or the Department of Tethered Aviation. We are a kite camp in a city alive with art and excitement. The character of the city is derived largely from the non-commercial nature of the event. The importance of the absence of commerce cannot be overstated. The core of the city is made up of a diverse collection of high-functioning artists, thinkers, makers, and organizers. It is without a doubt one of the largest art events in North America. 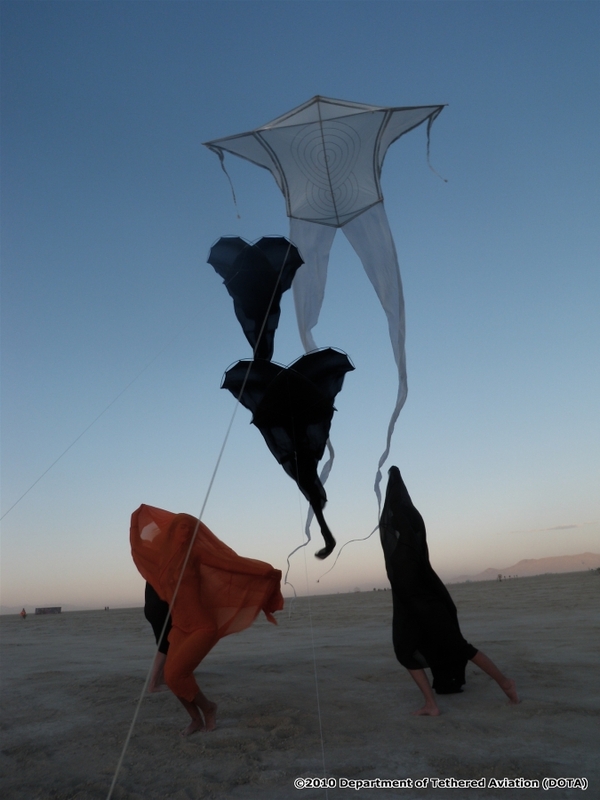 After over 20 years of serious kiting I can say without hyperbole, that of all the places I have ever flown kites, Black Rock City is not only the most difficult, but also the most rewarding both socially and artistically. I read a piece of text by Scott Skinner as my wife Ruth Whiting and I rode with Jose Sainz off the playa after an amazing time there this year. Scott is the founder of the Drachen Foundation and after many years of tactics, we finally had him in our camp. The piece of his I read was a preface he wrote to his first year at Burning Man from his perspective as a serious long-term kite flyer. Scott brought up some things in his writing that really struck a chord in me because I too have had the very same thoughts. One of the main ideas that Mr. Skinner brings up is that while we kite fliers travel from kite festival to kite festival, we are largely “preaching to the choir” as it were. This is to say that the people that we see at kite festivals are either our piers, or members of the general public who have volunteered their time and presumably at least some of their openness to our world of kites—even if they think it is only for their children. Where else then might provide a venue for kiting to be taken seriously—from my experience, far more seriously? 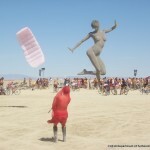 Mr. Skinner argues with good reason that Burning Man is perhaps a perfect environment for this. 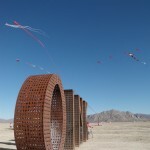 The design formula for artistically successful kite flying at Burning Man is not trivial to solve. After six years there I feel as though I am only just starting to get a real grasp on it. That is not to say that I haven’t done great kiting there every year. However, it is only now that I am seeing how to design specifically for the predictably chaotic, ever-changing, and extreme conditions out there. When the wind is good there, it can be amazing. But it never ever lasts more than an hour or so in any single state. 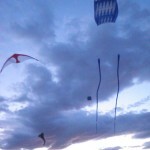 How then, do you put up a large kite, or large number of kites in a short amount of time? How also do you handle the group of kites if they come down within the crazy web of bikes, people, burning cars, and other sharp, electric, sometimes moving sculptures out there? How also, with all of this to consider, do you provide something with artistic significance? The solutions are out there. The desert and the event push us all to our limits as both designers and artists. Over my lifetime invested professionally in kites, my view of the occupation continues to change both subtly and steadily. As a very young child, my first kite experiences grabbed me firmly. I was not clear why, but I knew there was something in flying kites that I’d never felt anywhere else. Initially I fixated on the kites themselves. Not just in my head with the excitement over whatever new kite I had at the time, but I literally had a narrow view of the objects themselves in the sky. Soon however, this gave way to my vision opening up to include the rest of the sky, the ground, and even the horizon. The truth is, that holding a kite does something special to a person. 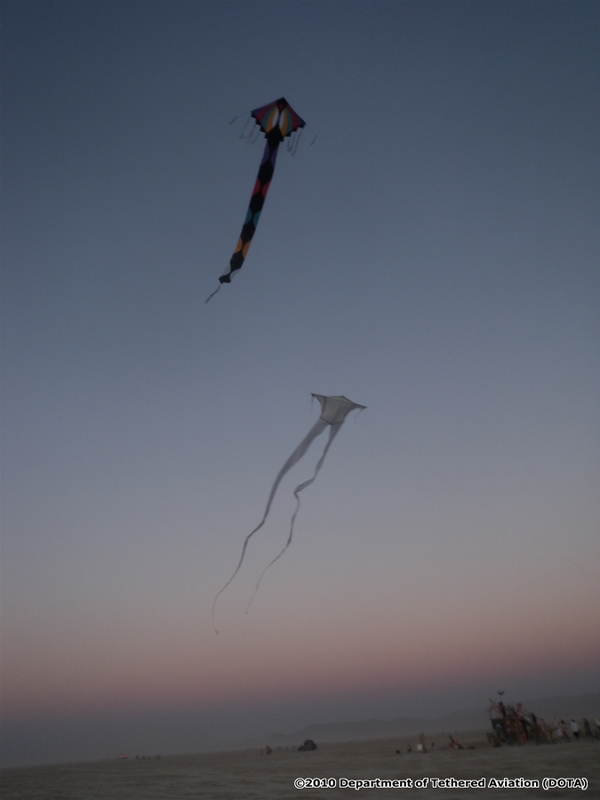 It took many years to realize how and why kites had defined such a unique place in my personality—why unlike many other interests, kites continued to expand my awareness of what it meant for me to be alive. The idea, in its simplest form is this: Kite flying connects a person’s nervous system at the tips of the fingers directly to a world of the unseen that is all around us, all the time. The kites themselves are actually somewhat incidental to this fact. They are wind sensors that transmit directly to us. Each kite we learn about teaches us that there is something more which we still don’t see. It is not the kites we crave, it is the connection that we forge with our natural world that grabs us. So we design new sensors to see even more of the texture and infinite qualities of the wind. Two ideas from old-world culture come to mind. The Japanese say that to fly a kite is to hold the sky in your hands. The Native Americans said that our disconnection from our natural world began as we first started to wear shoes. 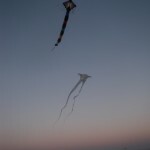 It seems to me that the seriousness and depth of what kites can mean can easily be seen within this context. 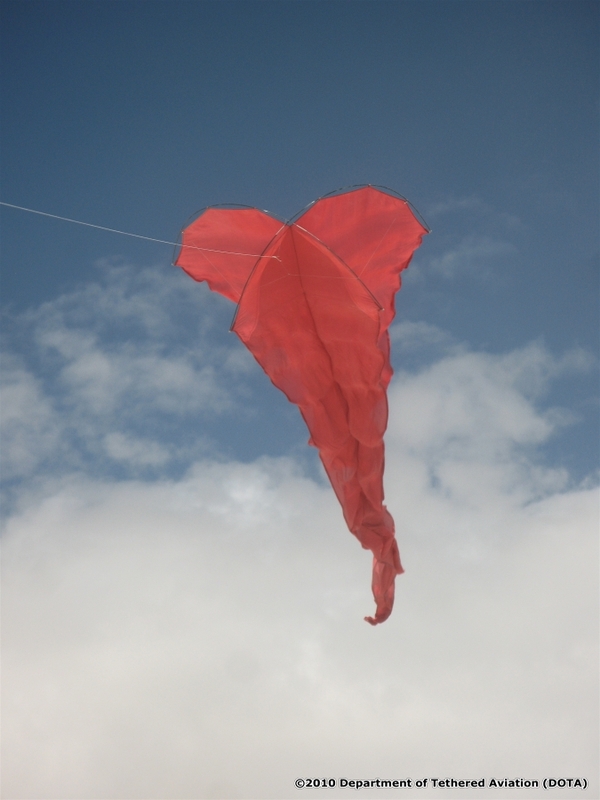 Those of us who are driven to design, build, and fly kites know that the truth of our passion happens to be lost on most people. Because of the incredible atmosphere, and the admittedly filtered demographic, for the participants at Burning Man a few more pieces of this puzzle are in place. There and only there am I asked first “did you make those?” or “are you the artist?” instead of “how much did that cost?” or “where can I get one of those?” These questions not only show deep awareness and true appreciation, but also an expectation that if it is brought and presented in Black Rock City, that in all likelihood, it is much more than a product. 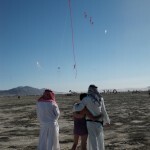 Burning man was the very first place I had ever flown kites where people came to me, and said two simple words “thank you.” Time and time again I hear this there. Each and every time I hear it, the words come to rest softly inside me. They touch me with a deep sense of satisfaction—in fact I know what they are thanking me for. 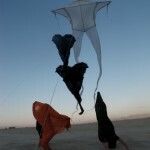 It is the serenely simple and delicately complex dance that kites will show the person who is paying attention. It is what all of us who have been taken in by the wind knew the moment it touched us. Do they see what we see? Who knows such things? One thing is for sure though, they too are touched by our passion. 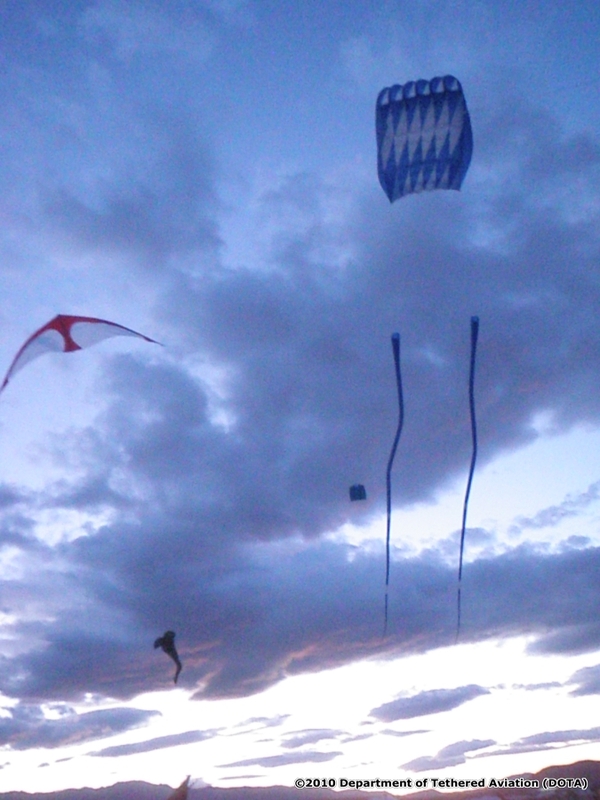 These are kites made and presented as high art. 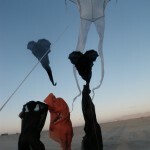 At Burning Man more than anywhere else, they are received as such. The people in our desert city are not only there to see and receive these things. Perhaps more importantly, the majority are also there to give back. They come there just as we do, to give a huge part of themselves in one form or another. Do some reading on the event to see what I mean by this. 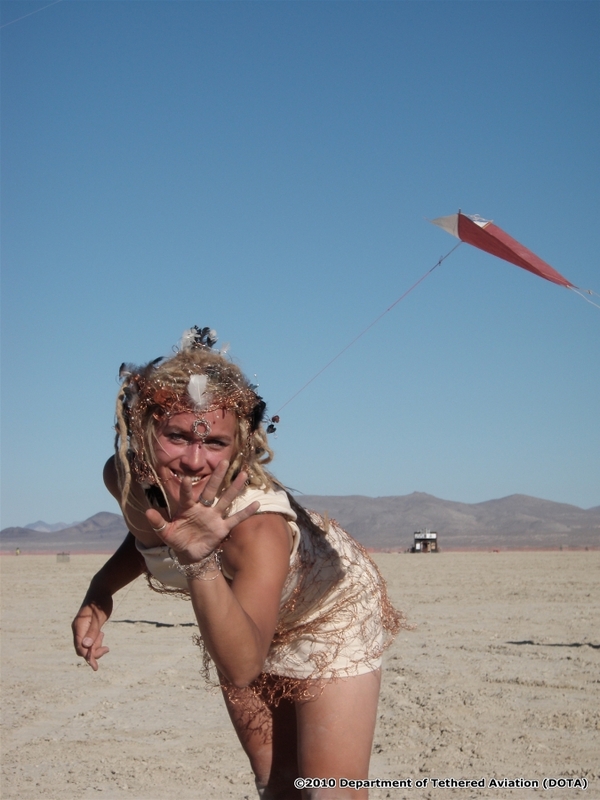 It is the core of what Burning Man means to me. It is this fact that allows us to realize that the kites we fly for this city are indeed a gift. These are the people who know that they are given a choice in life, even if they are only aware of it at a nearly subconscious level. If you are devoted to a passion, then you know that you will choose to work harder for that passion than any amount of money could ever represent. This is what you find there. People from all walks of life working both impossibly hard and amazingly smart to make magic happen from their passion whatever that might be. And maybe, just maybe, if all the conditions line up, the artist will be lucky enough to share it with someone else who is touched deeply enough to say thank you. 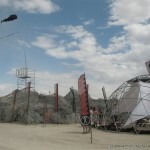 For more information about Burning Man, visit their web site. 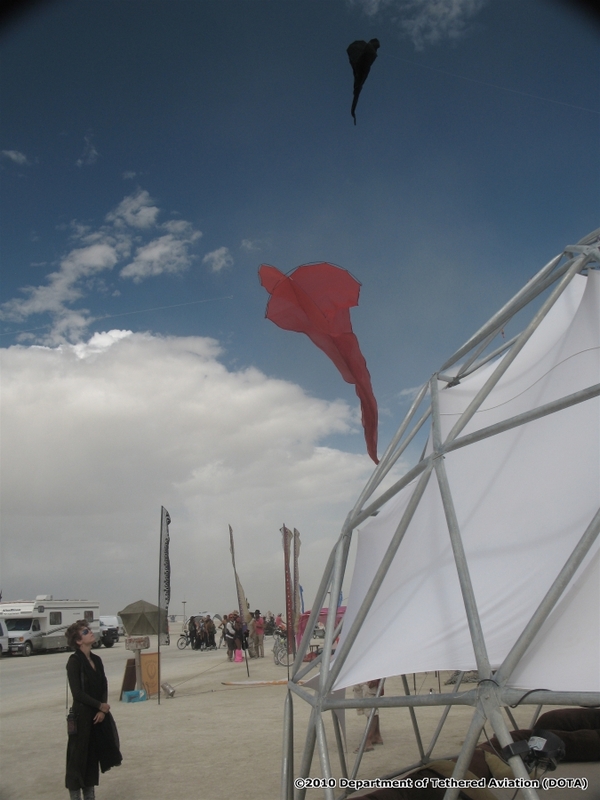 This entry was posted in 2010, Drachen, Issue 74 (Sep/Oct), Kite Columns, KL Archive and tagged burning man, drachen, windfire.